Thursday was opening day of the Greenville Drive's 6th season, and even more importantly it was $1 Drink Night. Fluor Field's dollar beer night features Natural Light and Pabst Blue Ribbon drafts for only a buck. So naturally, to get the most bang for our buck and save time, Mr. T and I double fisted throughout the game along with everyone else. 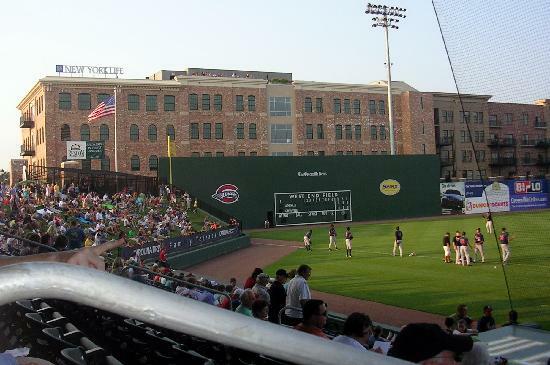 Fluor Field is modeled after Boston's Fenway Park. The field has the same dimensions as Fenway, and even has their rendition of the famous "Green Monster" which I have appropriately renamed the "Greenville Monster". The large manual scoreboard reaches 30 feet high in left field. The Drive won that night, beating Augusta 12 to 6. Mr. T and I had an absolute blast. We ate dinner before we went, which I would recommend because all of the concession stand lines looked pretty busy. Plus, with a beer in each hand there was no room to hold food. It was a great way to start off the new baseball season and we cannot wait for the next Thursday night game!